One of the finest 17th century country houses in East Anglia with a remarkable Stuart architecture and fine Georgian interior. There is a extensive library and Grand Tour collection. The house is surrounded by a lovely walled garden, orangery and orchards and there are many lakeside, parkland and woodland trails to explore. 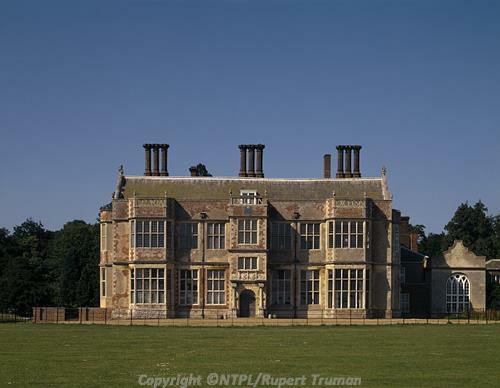 The hall and park are owned and managed by the National Trust. Near Felbrigg village, 2 miles southwest of Cromer; entrance off B1436, signposted from A148 and A140. Free on site parking 100 yards from the property. Shop. Secondhand bookshop. Dogs allowed on leads in park. Baby changing room. Front carrying baby slings and hip carrying infant seats for loan. Refreshments. Introductory tour of house at 12 noon on open days (if available) except Bank Holidays. there is an extra charge for the tour. Parking: separate disabled parking, 100 yards from entrance and drop-off point. Building: ramped entrance, four wheelchairs, ground floor has one step from Bird Corridor to kitchen corridor, many stairs with handrail to other floors. Photograph album of displays, DVD. Adaped toilet close to shop and restaurant. Grounds are partly accessible, loose gravel paths. Map of accessible route available. All weather path through the woods. One single seater powered mobility vehicle. Shop: level entrance. Refreshments: level entrance. Braille and large print guide. Induction loop in reception, shop, restaurant. Open Bank Holiday Mondays and Good Friday.